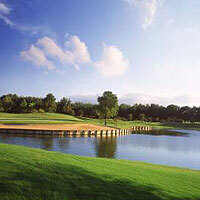 Pete Dyes Subhapruek Golf Course seems content to remain in its current position of Bangkok's best-kept golfing secret. A pleasant breeze is often present and this course just lays itself in front of you and gives you exactly what you see. This is a challenging, but fair test of golf and gives higher handicappers escape routes on the more difficult holes. The two finishing holes on each nine are the highlights, the Par 5 8th doglegging slightly around a lake and the Par 4 9th also protected by water on the entire right side of the hole. The 18th is reminiscent of the 18th at the TPC at Sawgrass and is one of the prettiest holes in Thailand golf. Better players tend to appreciate this course, it's probably the best value for money in Bangkok and if you're not concerned with five-star service or facilities and just want to play a great track, Subhapruek should be at the top of your list. New driving range where you hit into water and new fleet of golf carts makes this course even more attractive.